Take the world's most recognizable celebrity. Add a rogue Tenma clone. Season to taste with black market clones, a psi detective, and mysterious assassins… What have you got? 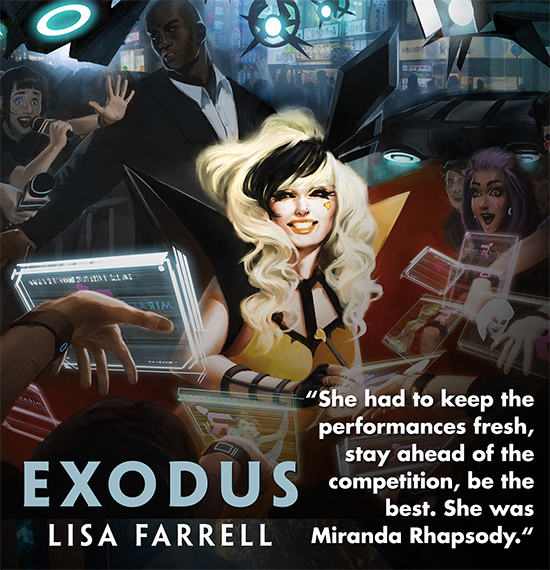 A recipe for Exodus, the Android novella by Lisa Farrell that is coming soon to hardcover and digital formats. …two million credits in escrow was worth the risk. He would do this one last job, and then he could afford to replace any outdated programs in his arsenal, update his console, and take more jobs that could be done solely on the Net. He was growing beyond the Tenma specs, as Li11ith had always said he would. He couldn’t afford to get caught now. Set in the not-too-distant future described by The Worlds of Android, Exodus follows the story of Ken "Express" Tenma for 112 pages as he races through New Angeles on the back of his Qianju to deliver a stolen package to the Colombian border. Even as Express looks to smuggle Miranda Rhapsody out of New Angeles, others are looking for him. The NAPD wants to question him about the murder of the runner known as Li11ith. And Jinteki can't afford to let Express reveal his discovery; they want to make him—and their problems—disappear forever. And Miranda? She has to deal with the realiziation that she might not be the woman she thinks she is. …The world streaked past and Miranda wished she hadn’t taken that stim after all. The Tenma’s driving was illegally fast and incredibly dangerous. Why didn’t he take to the sky? Written from multiple points of view, Exodus asks us how we define our humanity, even as it carries us along high-speed chases through the skylanes and down into the Colombian underground and its black-market clone trade. We follow detective Caprice Nisei and her pursuit of Li11ith's murderer. We learn more about Jinteki and NBN. And we learn more about the nature of clones, even as we're prompted to ask ourselves what makes clones like Express, Caprice Nisei, and Miranda Rhapsody stand apart from the masses. __All celebrities are manufactured. Some more than others. 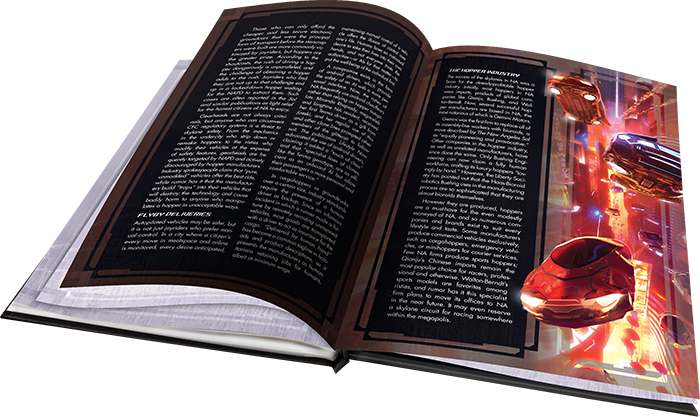 In addition to its high-speed pursuit of Ken "Express" Tenma and his story, the limited edition hardcover version of Exodus features a 15-page full-color insert, full of rich backstory and Android setting details. How does someone rise above the ceasless media chatter to become a ubiquitous celebrity presence? Just how good is the Qianju PT 7000? What guarantees does Jinteki offer its clone buyers, and how do clones deal with the mental strain of freedom? By answering these questions and more, the bonus material in the hardcover edition of Exodus adds greater depth and detail to the ever-evolving Android universe, making the book a must-have for every serious fan of The Worlds of Android, the Android universe, and the games set within it. Exodus is scheduled for release in the fourth quarter of 2016!